The run will set off Aug. 6 in El Paso, Texas, and take the guys through an Oct. 7 stop in Dodge City, Kansas. At the shows, expect a mix of classics and new tunes. Most of the bands on the main roster have new music out, with the exception of Saving Abel, according to a press release. 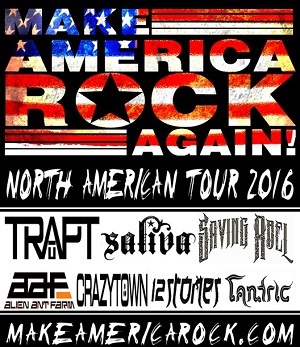 Drowning Pool, Fuel, Saving Abel, Crazytown, 12 Stones and Tantric are also on select dates. For information, head to MakeAmericaRockAgain.com.